Goat is the most widely consumed red meat in the world, but it rarely makes it onto most Americans' tables. Enter: No Goat Left Behind. Trying to solve that problem is Heritage Foods USA’s No Goat Left Behind program, which has given the goat meat industry a small but stable boost. The organization connects dairy goat farmers that have extra kids to New York City restaurants who want to try out the meat. The culmination of this program takes place in October, or Goatober, a month-long menu event with the goal of providing financial stability to farmers and introducing goat meat to diners. Goat cheese is wildly popular in the U.S. ”“ in direct opposition to goat meat. But “to make cheese you need milk, and to get milk, animals need to get pregnant,” says Erin Fairbanks of Heritage Food USA, an organization dedicated to helping small farmers and creating a sustainable food system. This means that there are many goat kids being born each year that are not needed for milk. “As consumers you’re kind of divorced from these realities,” she says. The reality is this: Female goats give birth every spring on over 30,000 dairy goat farms in the US, but their babies, particularly the males, don’t have a secure place in the farms’ architecture. To raise these goats, farmers have to feed them expensive milk replacer (basically baby goat milk formula) because the mother’s own milk is being used to make cheese. Unlike in the beef, pork or chicken markets, wholesale buyers rarely buy goats for meat. Instead, a quarter of all goat kids raised in the US are sold directly to consumers or to small markets. Finding these consumers and arranging slaughters takes time and energy ”“ often time and energy that small farmers just don’t have. Because the price of taking care of new goats in an unstable goat meat market is often too much for farmers financially, many of these goats are sold at auction for meat ”“ “a hard choice from a humane and animal welfare perspective,” says Fairbanks. In extreme cases the kids are killed at birth to unburden the farmer from caring for goats with little market value. The No Goat Left Behind program was started because of all this. Goatober is an alternative to these hard choices and the instability for farmers. “It gives purpose to the lives of the little bucks,” says Emily Sunderman, co-owner of Twig Farm in Vermont, a participant in the program. It’s also a way for Heritage Foods USA to bring goat meat into mainstream diets. For this program, they work with about 50 restaurants throughout New York City, all of which commit to purchasing goat meat from local dairy farms. “Anything they do in terms of getting goat meat into the normal eating habits of Americans benefits the goat diary industry,” says Sunderman. Goatober or not, sales of goat meat are growing. In fact, the industry is one of the fastest growing segments of livestock production in the United States. But to catch up with beef, it has a ways to go. The latest reports ”“ the few that cover goat production — indicate that there are approximately 3 million meat goats (and about 400,000 milk goats) in the U.S., compared to 89 million beef cattle, according to the USDA and the National Cattleman’s Beef Association. It’s not that goat tastes bad — it’s just that the word “goat” itself drives eaters away. Perhaps calling it “Caribbean lamb” would increase sales. The lack of American interest in goat meat is in many ways confounding: it’s affordable (often clocking in around $5 per pound), lean, and often produced on small sustainable farms. Not to mention: It tastes good. “Like lamb,” says Howie Velie, an associate dean of the Culinary Institute of America, and a chef with over 30 years of kitchen experience. “It’s not a flavor issue; it’s the word more than anything else,” he says. Perhaps calling it “Caribbean lamb” would increase sales. “I’m interested in supporting wholly integrated farms and humanely raised food production and this goat program is part of that,” says Peter Hoffman, the owner and chef at Back Forty and Back Forty West in Manhattan, both participants in Goatober. “The more that people eat goat the more that those farms can be self sustaining.” For the past two years diners have found grilled goat chops on the menu in October. 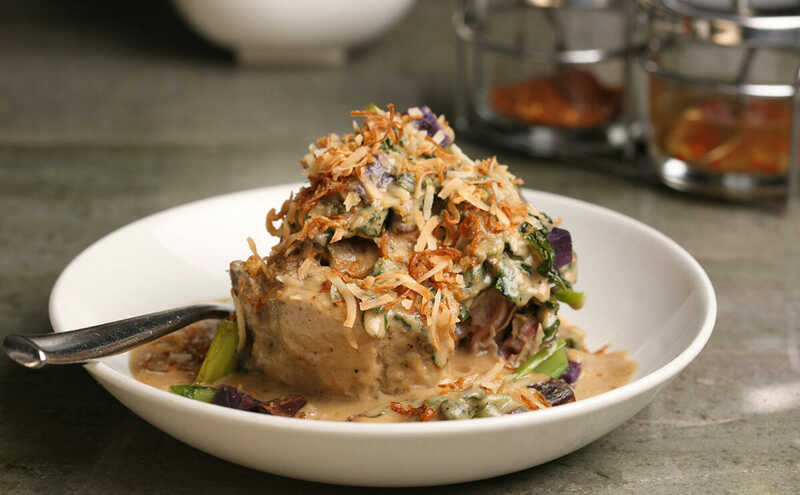 Though he does not directly participate in the program, it’s basically Goatober all year long at Kin Shop, Harold Dieterle’s Thai-inspired restaurant in Manhattan. The winner of Top Chef season one has raised a few eyebrows with massaman, a braised goat, on the menu. “People generally are surprised and curious,” he says. Some have the idea that the meat will be gamey but the tender center cut of the neck that Dieterle grills and then braises for three hours can easily be described, according to this reporter, as a flavorful and sweeter version of beef. So why aren’t we eating goat meat? Fairbanks guesses most folks simply have no experience with eating goat ”“ or perhaps have had an unpleasant one eating curry cooked with older goat, which might have a gamey taste or tough texture. “When the animal is younger, it’s going to have a more delicate, grassy, vegetal flavor,” she says. Another hurdle for goat meat: Consumers don’t see it on menus. “It’s not part of the fine dining culinary landscape,” says Fairbanks. But she’s hoping No Goats Left Behind and restaurants like Kin Shop can help change that. Perhaps Americans can be convinced. After all, goat cheese, the main source of income for the farmers who participate in No Goats Left Behind, is a fairly recent addition to mainstream diet. Luckily goat chops and massaman fit the bill. both sides till golden brown. Remove from pan and add the aromatics and white wine. Cook for 2 minutes and add the chicken stock. Return the necks to the pot. Cover with foil and cook for 2 ½ hours at 325F. In a large sauté pan on medium heat, add the oil and heat. Cook the shallots and garlic for 1 minute. Add the mustard greens, season generously and cook for 10 minutes. Place the greens in a perforated hotel pan to drain the excess water out. Bring salted water to a boil. Blanch the yams till soft, around 4 minutes. Shock in ice water. Mix yams with mustard greens and set aside. In a spice grinder, grind the coriander, cumin, cloves, nutmeg, cinnamon stick, cardamom, and mace into a fine powder. Place all ingredients except peanuts in a powerful blender, and puree using some of the water from the soaked chilies. Once smooth, add the peanuts and season with salt. In a sauce pan on medium high heat, add the duck fat and fry the curry paste for 2 minutes. Add remaining ingredients, except the pineapple juice. Cook for 20 minutes, and add the pineapple juice at the end. Fry coconut flakes and shallots in oil. Mix in dried shrimp. Set aside to be used as garnish. Place the braised goat neck on the plate. Top with cooked mustard greens and purple yams that have been mixed together. Top with curry and garnish with the fried coconut mix.